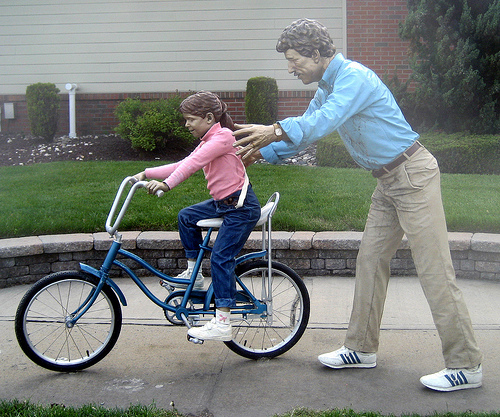 "First Ride" Sculptures by J Seward Johnson Jr - Bicivilizados. Ciclismo urbano. Alegría entre tus piernas. 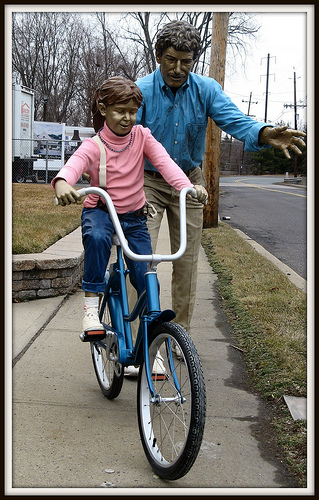 John Seward Johnson II (born 1930), also known as J. Seward Johnson, Jr. and Seward Johnson is an American sculptor known for his trompe l’oeil bronze painted sculptures. While early in his life, his artistic life focused on painting, he turned his talents to sculpture in 1968. Mr. Johnson is most well known for his life-size cast bronze statues of people of all ages engaged in day-to-day activities such as a father teaching his child to ride a bike, a woman sunbathing, and two people on a park bench. He is the son of J. Seward Johnson.